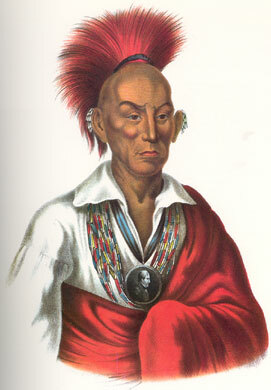 An illustration of Black Hawk, from History of the Indian Tribes of North America. "[Later], deter­mined on the final extermination of the Osages, for the injuries our nation and people had received from them, I commenced recruit­ing a strong force, immediately on my return, and started, in the third moon, with five hundred Sacs and Foxes, and one hundred Ioways, and marched against the enemy. We continued our march for several days before we came upon their trail, which was discovered late in the day. We encamped for the night; made an early start next morning, and before sun down, fell upon forty lodges, and killed all their inhabitants, except two squaws! whom I captured and made prisoners. During this attack I killed seven men and two boys, with my own hand."